Osogbo (also Oṣogbo , rarely Oshogbo) is the state capital city of Osun. Osogbo city seats the Headquarters of both Osogbo Local Government Area (situated at Oke Baale Area of the city) and Olorunda Local Government Area (situated at Igbonna Area of the city). It is some 88 kilometers by road Northeast of Ibadan. It is also 100 kilometers by road South of Ilorin and 115 kilometers Northwest of Akure; Osogbo shares boundary with Ikirun, Ilesa, Ede, Egbedore and Iragbiji and is easily accessible from any part of the state because of its central nature. It is about 48 km from Ife, 32 km from Ilesa, 46 km from Iwo, 48 km from Ikire and 46 km from Ila-Orangun; The City boasted of a population of about 156,694 people, based on the 2006 Census; the postal code of the area is 230. Osogbo, sometimes called "Ilu Aro" (home of dyeing), is a major dyeing center. The traditional industry is one of the major industries of Osogbo. A number of industries also began to rise after independence, notably small scale establishments involved in textile, foam making, and pencils. Osogbo was made a major industrial development center by the government of Nigeria during the 1970s. 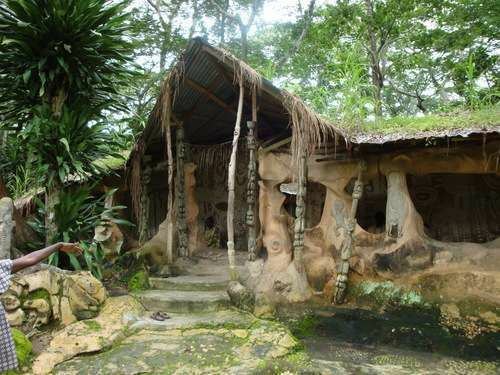 Osogbo is also the childhood home of the actor and dramatist Duro Ladipo and the Muslim scholar Sheikh Adelabu.